The Siberian Crane, Grus leucogeranus, also known as the Siberian White Crane or the Snow Crane, is a bird of the family Gruidae, the cranes. This species breeds in arctic Russia in Yakutia and western Siberia. It is a long distance migrant. The eastern population winters on the Yangtze River in China, the central population at Keoladeo National Park, India and the western population in Fereidoonkenar and Esfahan in Iran. It breeds and winters in wetlands, where it feeds on the shoots, roots and tubers of aquatic plants. 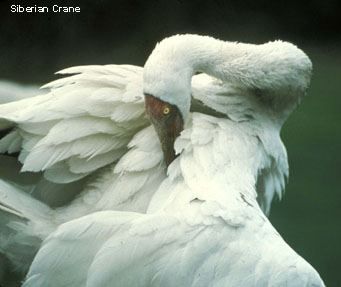 This is a large white crane, reaching 140cm in length. Adults are all white, except for a dark red mask extending from the bill to behind the eye. It has a yellow iris and reddish legs. The male is slightly larger than the female. Juveniles have a feathered mask and buff or cinnamon plumage. The voice is flute-like and musical. The status of this crane is critical, as it is expected to undergo a rapid population decline in the near future. The wintering site in China holding 95% of the population is threatened by hydrological changes caused by the Three Gorges Dam. 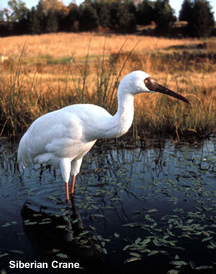 The Siberian Crane is one of the species to which the Agreement on the Conservation of African-Eurasian Migratory Waterbirds (AEWA) applies.